Cob Jockey: A Non-Horsey Weekend with a Surprise Horsey Twist! A Non-Horsey Weekend with a Surprise Horsey Twist! - There are multiple skills and events, all drawing from different sports, to practice. - It's a test of heart as well as athletic ability. - Competitions are objective rather than subjective. - It's not the strongest or fastest athlete that wins, but the most well-rounded athlete that wins. My weekend wasn't without horses, though. On Sunday, dozens of massive horse trailers and semis started pulling in to the Ohio State Fairgrounds, so of course I went to investigate. 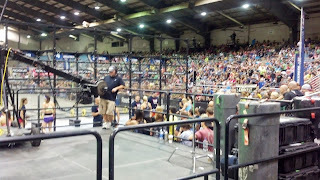 Turns out two buildings down from CrossFit folks were moving in for the 53rd Annual Morgan Gold Cup Show, an "A" show. I had heard of, and seen photos of, A show stuff before, but never seen it in person. I was so in awe, and explained to Nicole that this is not a part of the horse world I'm familiar with. It was amazing seeing them actually constructing wooden structures for these tents, and the golden lamps and other decorations on the stalls. 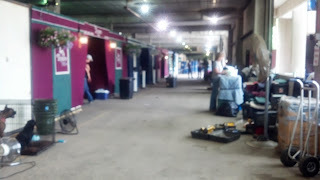 Since I felt bad for traipsing through the stable areas in flip flops and workout gear, I chatted with one woman and explained that I was just a curious eventer. She invited me to hang around, but I couldn't, duty called. 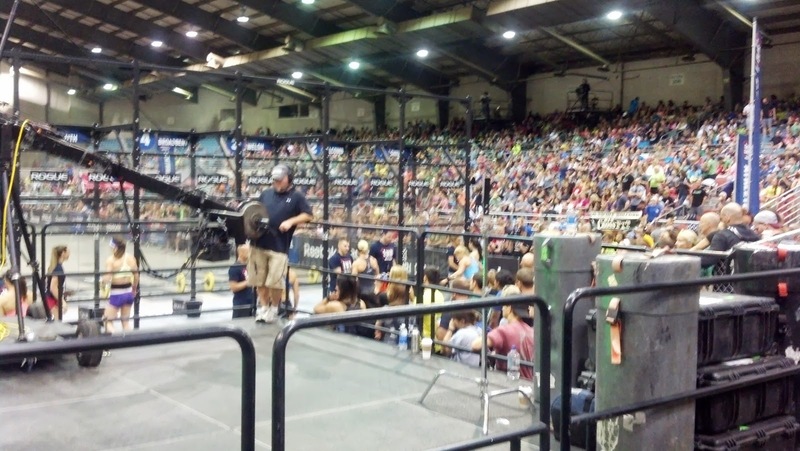 6,000 spectators, sold out two days in a row! Nicole took second in this event - also, check out the similarities between perfectly centered balance here and in the saddle. Position is different, but alignment and balance are not. Heels down, chest up! wow! That's amazing, you are so busy! Awesome that you gut a horse twist to the weekend to!